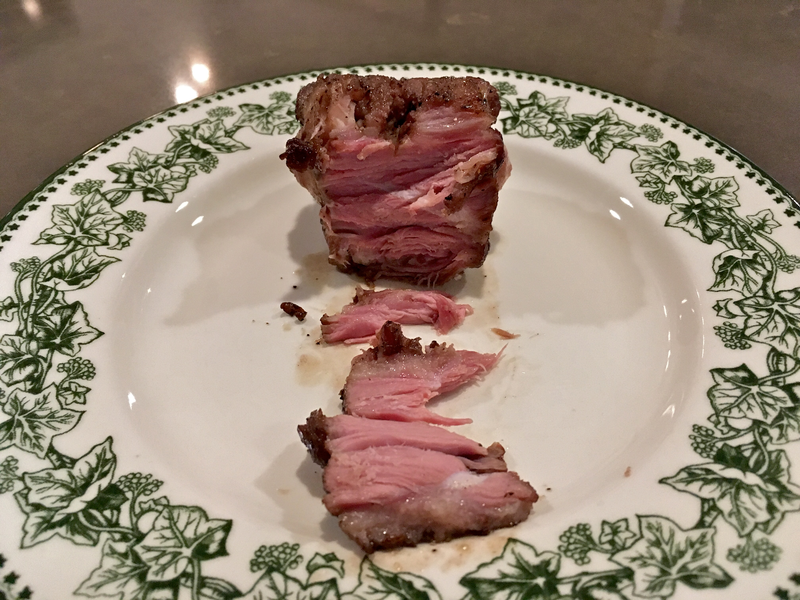 I was talking to a friend about my oxtail steak I once plugged at r/sousvide. I was telling him how I got mostly negative feedback along the lines of “an oxtail is an oxtail is an oxtail – you stew it”. Retelling this story reminded me of pictures I took while undertaking that 24-hour endeavor. Here is one of these pictures. I love oxtail. 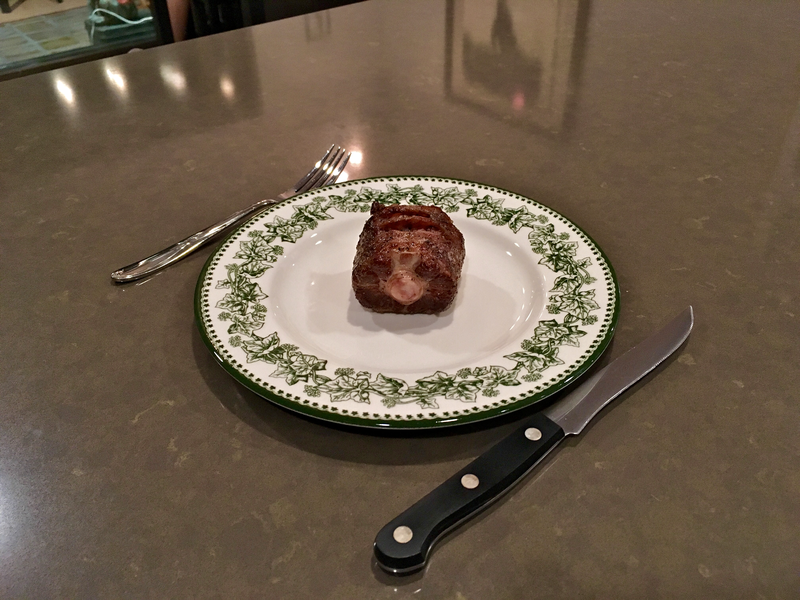 But instead of stewed or braised oxtail, I wanted to try to cook it like one did a steak, against the ridicule from the master of my household of two. I wanted a chewy, steak-like meat texture for my oxtail, if possible. 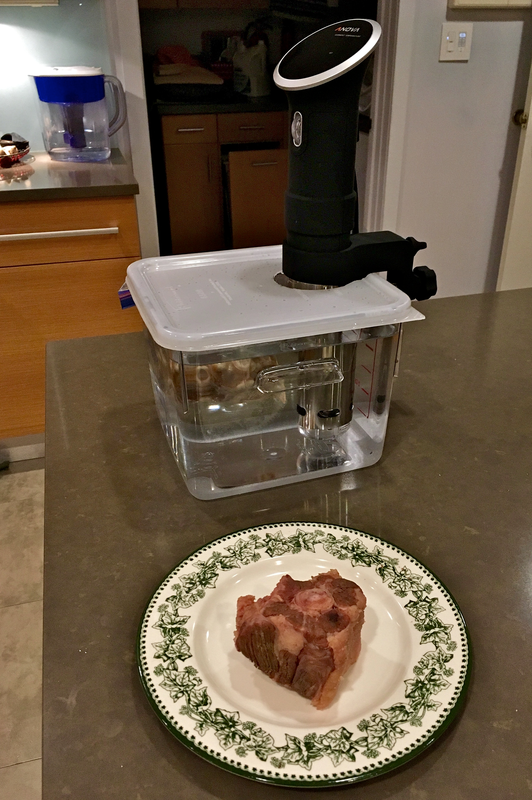 As I put the oxtail in the water bath, I wrote on r/sousvide asking whether this was a crazy idea. Most people said yes. But I soldiered on. 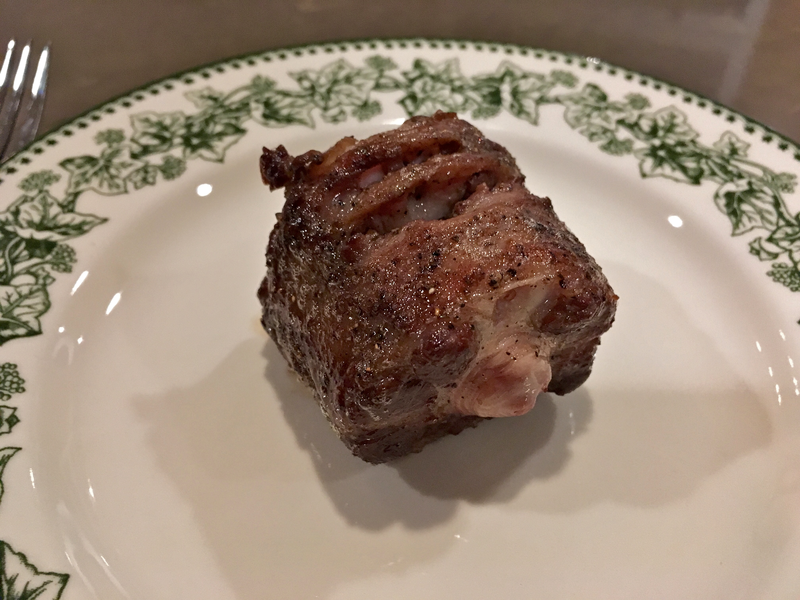 Sous vide recipes online mostly call for 100 hours at 140ºF, or 24 hours at 180ºF, when dealing with oxtail. And none of them try to finish oxtail as steak. I ended up leaving the oxtail in the bath for only 24 hours at 140°F, as planned. Then I pan-seared it like I did steaks. 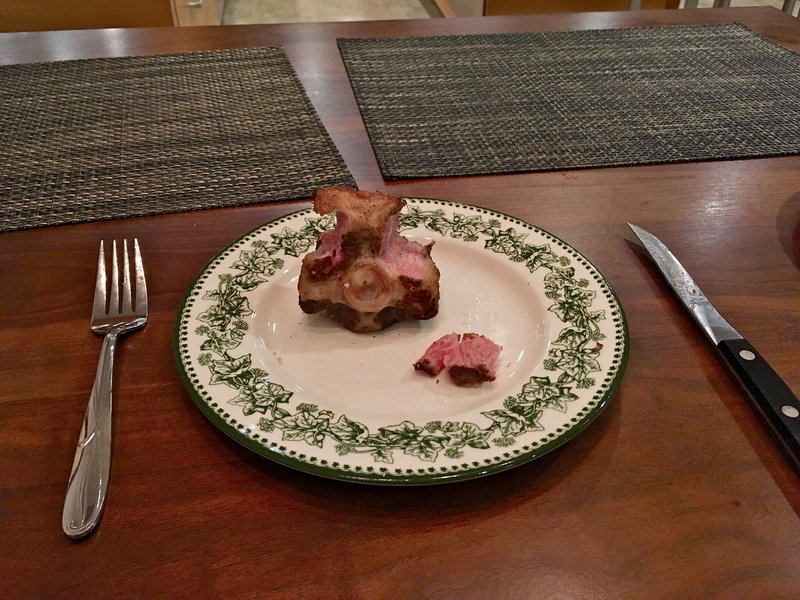 Redditors were right – one could bath oxtail for a lot longer than other parts. The connected tissues were still there, but were tenderized to the extent that they were now pleasantly chewy. Maybe others would have preferred to bath it much longer. As for me, however, I like to chew on steaks. So 24 hours worked for me. Here is what the meat inside looked like. This is what it looked like after its precious meat was carved out. Would I do it again? Probably not. It turned out great and I loved it. But this was a lot of trouble for very little meat. I think I am going to stick to tenderloins for now. 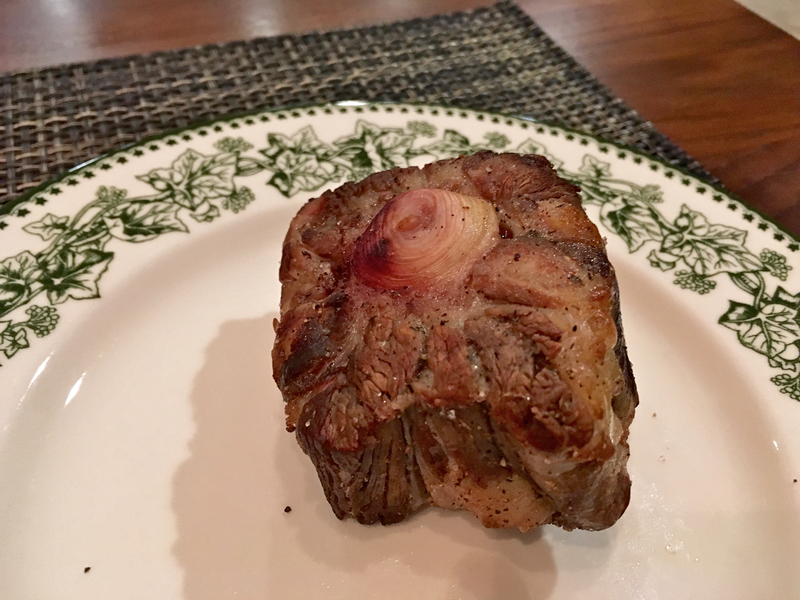 This entry was posted in Gourmet and tagged oxtail, pink, sous vide, steak, stew, tender. Bookmark the permalink. I really had ate that delicious Oxtail Steak from you, thank you very much for your serving and taking aout 24 h to do this job to make that steak be tender and very special.